Bicycle! Bicycle! : Pashley Princess Sovereign in Buckingham Black. After my initial search for an all-weather upright bike led me to the dead-end junction of retail frustration and bicycle shop proprietor aggression, I was ready to concede that Perth was still a bicycle backwater, at least so far as Dutch style bikes were concerned. A week had passed after my doomed Gazelle and Lekker test rides, another slovenly Saturday sat fat-bottomed on my horizon and I relegated skirt guards and built in lighting to the dusty box marked, 'Discarded Dreams'. But my melodrama was soon interrupted by Ginger, he came back from some early morning errand excitedly ejaculating about finding a shop stocking the third bike on my test ride list: The Pashley Princess Sovereign. Hand built in England with a lugged steel frame, dynamo headlight, integrated rear light, hub gears, fully enclosed chain case, skirt guard, rear wheel lock, wicker basket, Brooks saddle, frame mounted pump and 'Ding-dong' bell; The Sovereign is the Rolls Royce of Upright Bicycling. Image from official Pashley Cycles site found here. We immediately drove to the better-heeled part of town so I could see if the hype was justified. It was clear that the shop primarily catered to selling very expensive road bikes to men who believe in buying very expensive road bikes. Ugly team jerseys and taint specific saddles abounded. This was too usual a state of affairs to note in detail, the main difference between this and every other shop I had previously encountered (apart from the road bikes being more expensive) was that they had a section of 'obviously girly' upright bicycles. The kind of bicycles a status conscious roadie might be convinced to purchase for his girlfriend/wife without her consultation and then spend their weekend outings eye-rolling at her inability to keep up in the park. "Is that wicker basket slowing you down, babe? Should've got a carbon one!" (Side bar: If your significant other insists on calling you babe, then all the weight reductions in Roadie Land probably won't make a ride with him any less leaden.) However, when you live in a bicycle backwater you cannot mind the cynical motives behind a bike shop stocking town bicycles, you simply give silent thanks and then prepare to be patronised for your purchasing choices. Fully enclosed chain case means less chain maintenance, more weather proofing. Woah, hey! No derailleur! 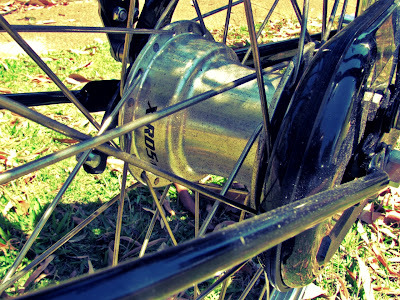 The rear hub. 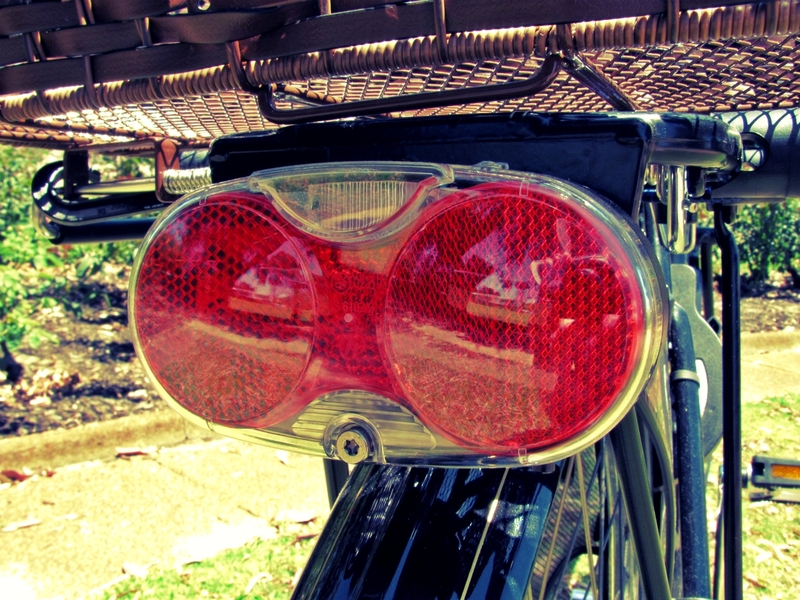 The dynamo driven headlight has a wide arc of illumination. The rear LED is steady (Not flashing), battery powered and very visible. The Princess Sovereign model comes in three frame sizes and two colours, 'Buckingham Black' or 'Regency Green'. The shop had one of each colour in the medium sized frame on sale as they were the previous model and had some shop soiling. 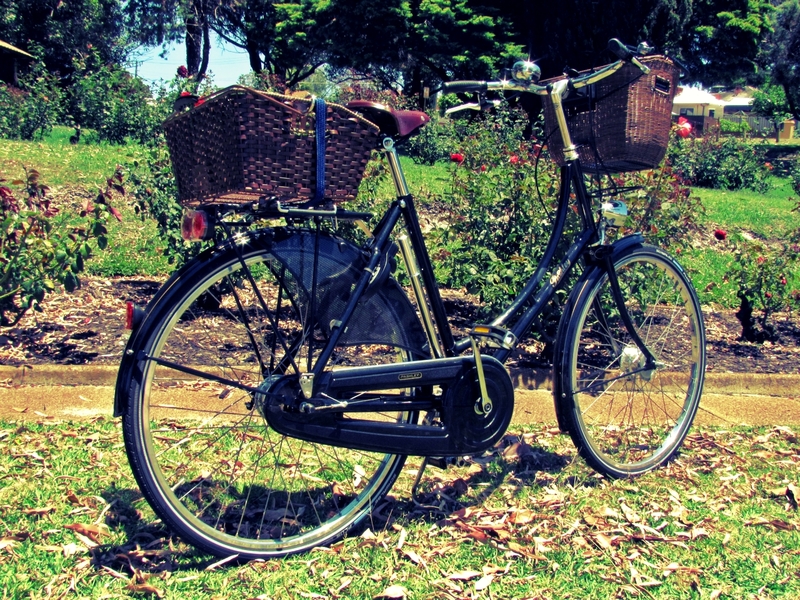 I crossed my fingers that I wasn't too tall (Pashley go by inner leg length so there is quite some overlap between frames) and then I rode them both along the leafy streets of Nedlands, dodging unnecessarily rugged 4WDs as I went. I was instantly pleased. Compared to the relative nimbleness of the steel Schwinn Jenny, the steel Princess Sovereign felt like a particularly elegant steamroller - I barrelled along the road propelled as much by inertia as peddling, the sheer weight of the Sovereign meant that what she lacked in quick starts she made up for in unstoppable force. The riding position was a great substitute for posture training and the distance between my knees and the handlebars gave a feeling of riding very neatly. It was obvious why they named her Sovereign - I couldn't help but feel regal. Compared to the Schwinn, everything felt more formal, from the harder saddle encouraging me to sit properly, to the super-solid pedals. 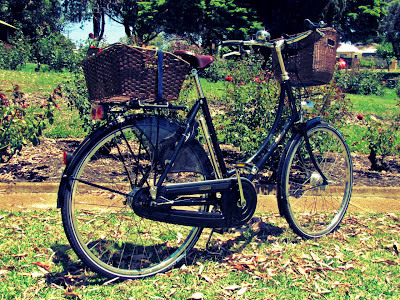 It required a more formal style of bicycling than the breezy, casual cuteness of the Jenny 7 Speed. 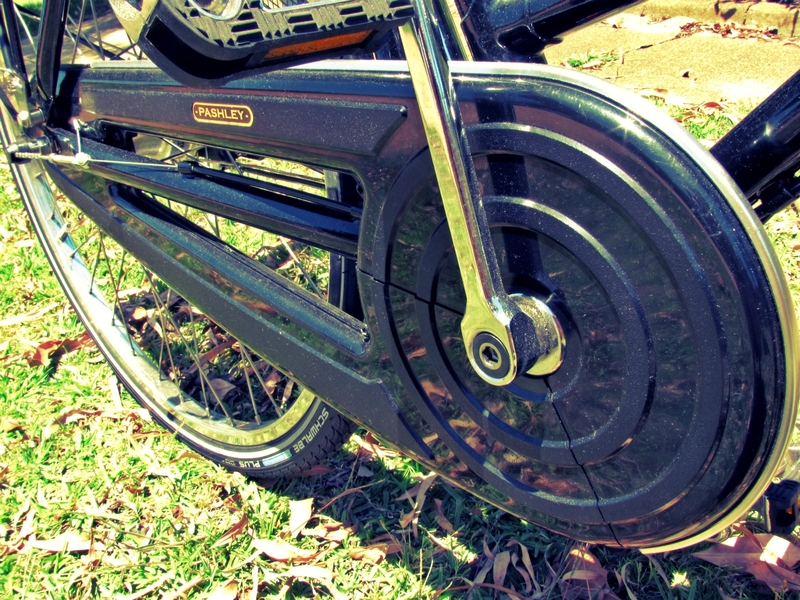 This was my first encounter with hub gears, though I was familiar with the 'thumb shifter' style changer mounted on the handlebars. It was quite the psychological leap to accept the fact I could change gears while at a complete stop or during active peddling. Still, I never quite got over derailleurs so I continue to pause cranking when I shift - at least it keeps me from getting back on the Schwinn and decimating the mechanism. The green Sovereign shifted smoother than the black (A hint of woe to be examined another time.) and this alone made the choice of colour difficult. As much as I wanted the black model, I could see it had been ridden a lot more and the green one actually had dust on it, so unloved was the colour. In the end I chose personal style over perfection and took the black Sovereign, though it was destined to cause trouble through no fault of its own. 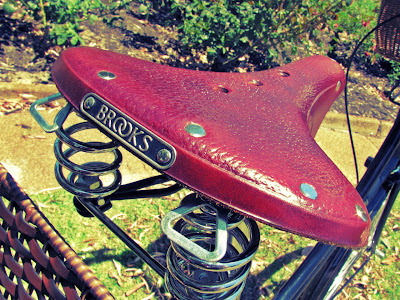 after the plushness of the Schwinn's comfort saddle but once it did, it was heavenly. The Princess Sovereign may look genteel but she has a surprising amount of street smarts. First there's the rear wheel lock. The key stays inside until the lock is activated, you push a lever down and it 'locks' the back wheel, preventing it from turning and making the Sovereign impossible to simply ride away. The weight then deters anybody from kidnapping. I combine the rear lock with a cable, thankful that I don't reside in a city where bike thieves strip Brooks and everything must be U-locked. (I still remove the French made pump when I leave it outside, though.) Looking at the wheels of the Pashley, you may wonder where the spoke mounted reflectors are. They are absent because along with great lighting, the Sovereign comes with Schwalbe puncture resistant Marathon Plus tyres which have a reflective sidewall. Very reflective, much more so than traditional reflectors. Here it is reflecting a flash in daylight. At night, flash photography makes it resemble a UFO. The tough tyres are perfect for urban environments, living near a pub in Perth meant there was often glass on the pavement outside my house and the Pashley accidentally rolled over shards on more than one occasion, never a puncture to blight her. Unfortunately, it's now a conscious effort to avoid rocks and glass on my other bicycle after I grew too accustomed to disregarding them. The tyres are that good. For all her toughness the Sovereign does retain some delicacy through the included wicker basket - despite the rack to hold it in place I couldn't bring myself to trust the lovely leather straps and woven wicker to the elements (This was to be my all-weather bike, after all) so on the way home from her liberation we stopped at Ginger's preferred bike shop (He had become a roadie, much to my shame.) and bought the incongruously stocked (For a standard roadie-centric shop - so they were on sale!) Bontrager faux-wicker front basket and attempted to purchase a matching rear one. This is where the Bontrager Vs Pletscher problem manifested. Both companies are heavily invested in the prestige of their rear racks and as such they have both created accessories compatible only with their specific carriers. After much examination, it was accepted that the Bontrager system was completely incompatible with the Pletscher rack, not even the rat trap provided a work-around. Fortunately, there was another rear basket with a spring loaded 'quick release' style, universal rack attachment that clipped it to the sides of the carrier. An occy-strap purchase later and it was semi-permenantly attached to the Pletscher. My Pashley Princess Sovereign arrived home, triumphant. secured with small black strap under rack. In the absence of a cargo net, I bought a second, more colourful and wider strap to secure loads. After over a year of riding it, I have found one flaw with the Pashley: It's so heavy that the kick-stand does not support it properly when unburdened and especially not when it's carrying a rear load. Many a time I've had to catch it and a few times I have failed and then had to straighten the handlebars. It's my desire to install a double stand (Like Dutch bikes often have) and Pletscher makes one I will eventually order online. Apart from that, I can say that for me the Pashley was absolutely worth the price. Though at about AU$1700, you can trust I have comprehensive bicycle insurance. (And also that I didn't pay retail.) It changed the way I ride - the weight and proportion required me to be more mindful in the beginning, to watch my technique. Once I mastered it, nothing could beat the feeling of stability and 'solidness' with the bizarre bonus that the more I asked the Pashley to carry, the less I felt like I was carrying anything, making the Sovereign an excellent transportation cycling/cargo option as well as a leisure ride. Unsurprising, as Pashley famously make old-fashioned cargo and work bikes for businesses in the U.K. Think mobile ice-cream sellers, deliveries etc. A woman even went touring on a Princess Sovereign so they're evidently built to carry. Pashley make roadsters as well as loop frames and have even recently delved into cruiser shapes. Whether this is folly remains to be decided by the market but so long as they continue to do what they do best, a few of these English gems will find their way to Australia and wait patiently to be appreciated. And the fat-bottomed will continue to pose with them on front lawns. P.S. For the one major fault inherent to the Pashley Princess Sovereign, I refer you to my more recent feelings on the bloody kickstand. P.P.S. A lot of traffic arrives at this post searching for the weight of the Pashley. Without knowing exactly I can confirm that my medium frame Pashley is pretty damn heavy by modern bicycle standards. Heavy enough that a very fit personal trainer friend remarked upon it when lifting the back and estimated it to be about 20kg. I am woeful at judging weight by lift so take this with a grain of salt. Just know you'll probably struggle to get it up more than a few stairs. This is a great write-up. You've nailed all of Pashley's many charms. I have the black one too! My only disappointment is that shifting gears can be a bit clunky, despite several adjustments by my bike shop. I may try getting the hub replaced to see if that makes a difference. For cycling through the Scottish winter, Pashley is ideal. Ironically I first discovered Pashleys while living in Melbourne! That kickstand is woe! But everything else is generally charming. I also had the Pashley gears adjusted (a tale of torture I am reserving for a post on here) and once they were 'right' they were perfect so I'd say you should definitely keep exploring your options. Apparently, proper adjustment of hub gears requires a properly hub gears experienced bicycle mechanic - a hard find in derailleur saturated Australia but I would hope quite common in the U.K. Thanks - I might persevere with getting the gears adjusted in that case. I also found the kick-stand pretty pitiful. I ordered the Pletscher double kickstand and got my bike shop to fit it. It's a million times better. If it helps any, my 'failed' gear adjustments did not include a test ride by the mechanic. First mechanic who rode the Pashley fixed it in one go. There was even a tag on the repair receipt ordering one of the other mechanics to take it up a hill post-adjustment. All of those attempts were carried out in the same shop but by four different mechanics. Barring manufacturing defects I really think it depends upon the person doing the fixing. I imagine this is what car ownership is like. Looking at the beatiful design, riding this bicycle can perhaps make one feel like a princess. Similar to other cargo bikes, it is durable, easy to handle, can withstand any type of climate, and of course, it is worth the price. 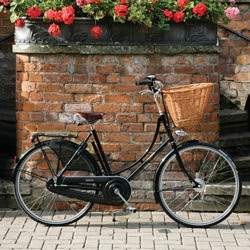 I just bought a black Pashley Princess Sovereign, and I love it. I have ridden road bikes for years. (I own a 23 year old Miata carbon fiber road bike.) I ride my Pashley to work, and for short errands. I have found that if you briefly stop pedaling, the gears shift very well. I also put an Ortlieb pannier on the back, and it fits perfectly with the Pletcher rack system. I got it through www.rei.com. I completely agree about the kick stand, and I also want to get the leather handlebar grips instead of plastic. Overall, I would say this is the coolest bike, hands down. Even my husband (who is the real Steve Orr), who rides a Trek Madone, thinks it's cool and might buy a commuting bike now. I am mulling purchasing the Princess Sovereign but have wondered about the kickstand. Is it possible to put a Roadster model kickstand on the Princess Sovereign? Gosh! I've been lucky with my kickstand it's always been sturdy even with a load but don't get me started on the IGH dramas. I will never get a 5spd SA hub again!